The Budget SLP: Have you visited KIZCLUB? As an SLP, KIZCLUB was my go-to site when introducing a new literature selection. I used the Storybook Patterns in PowerPoint activities, as story props when retelling a story, as visual supports, and on communication device overlays. This completely free site offers eight tabbed sections to use when preparing lessons for students in preschool and primary grades. 1. ABC'S - Alphabet activities and printables for writing practice. 2. PHONICS – Find pictures for plurals, position words, compound words, and many phonemic awareness activities. 3. 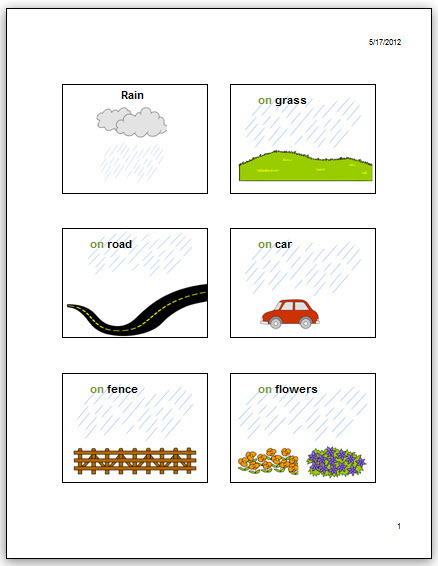 TOPICS – In this section, I found activities to support goals relating to inferences, position words, sequencing, retelling, syntax, and classification. Topics include colors, community, body and health, opposites, and much more. 4. CRAFTS – I have used many of the printable crafts as therapy materials. Print, laminate, and assemble for years of use. 5. STORIES AND PROPS - This section is huge! Stories are divided into three levels. Read these on-line or print to send copies home. The Storybook Patterns and Classic Tales Patterns are fabulous and the creator continually adds new sets. I made many, many PowerPoint activities using these patterns. 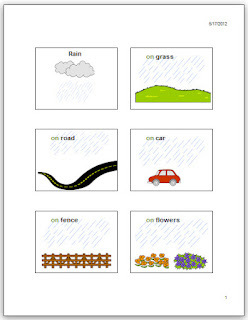 Click on Rain, a PowerPoint book that I used to encourage two-word phrases while reading Rain by Robert Kalan. I printed this as a handout, cut out the pictures and stapled them together to make a mini-book for each student. I also printed the actual patterns from KIDZCLUB, laminated them, and let students use a spray bottle to "rain on the ____." 6. 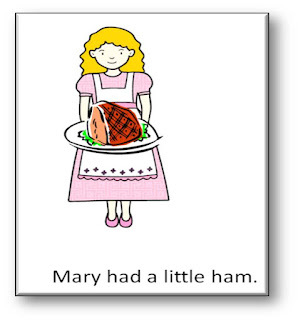 NURSERY RHYMES - Find rhymes, word cards, and corresponding pictures in this section. I used the pictures when teaching nursery rhymes. Click on Mixed-Up Nursery Rhymes to download a PowerPoint made for a listening activity during a phonemic awareness lesson. 7. FLASHCARDS – Flashcards in color and black and white depicting consonant sounds, prepositions, numbers, shapes, colors, and verbs. 8. TEACHING EXTRAS – Free clip art, play money, reward charts, calendars and more.